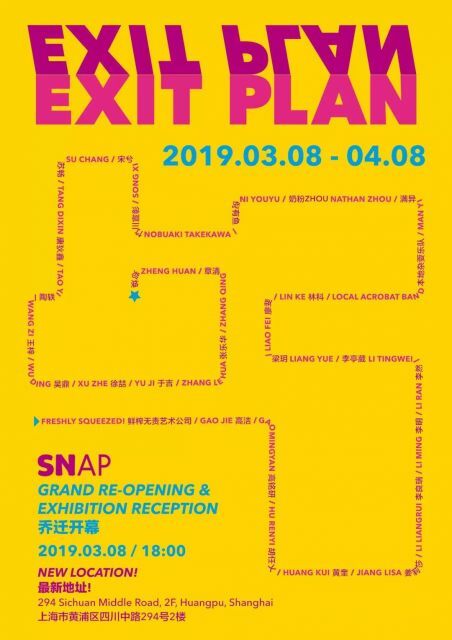 SNAP announces the opening of EXIT PLAN on March 8 in Shanghai. It is a colossal group exhibition bringing together the work of 29 contemporary artists and art collectives. EXIT PLAN is a strategy or rather a contingency plan to purge all that’s met, exceeded or failed to meet one’s predetermined criteria. As humans we each have our own evolution and it’s from this continual purging that we build our present realities. Providing a more diverse space for experimentation and exploration, EXIT PLAN examines the methodology of artists and of the art community they exist within. While converging a broad range of creative forces and all differing in evolutionary origin, together, they set out to embark on a new collective conversation. SNAP has moved their location just down the street to 294 Sichuan Middle Road, near Jiujiang Road and enthusiastically gives new life to this 1916 neoclassical structure and former German bank. Previous postMaggi Hambling’s first exhibition in China will be presented at CAFA Art Museum Next postWhite Space Beijing presents "Liu Shiyuan: In Other Words, Please Be True"